Daily motivational quotes for you to be inspired and move forward in life. We post motivational quotes everyday for 365 days. 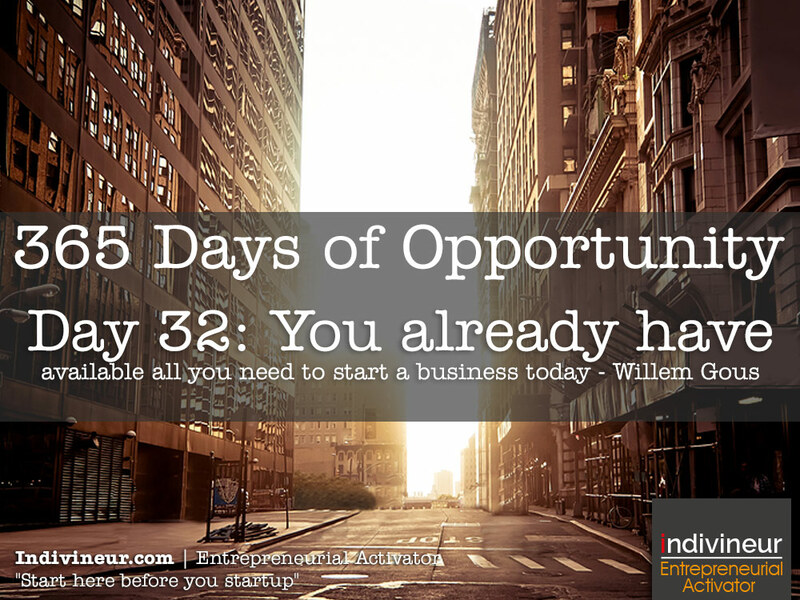 Day 32 Motivational Quotes: You already have available all you need to start a business today. “I don’t have anything” is what I hear often as the reason why someone can’t start a business and create a new successful future. That is a lie and a copout. Look around you at all the resources, knowledge and networks you have access too in any situation and you will see that you have all you need to start now. What are you waiting for? 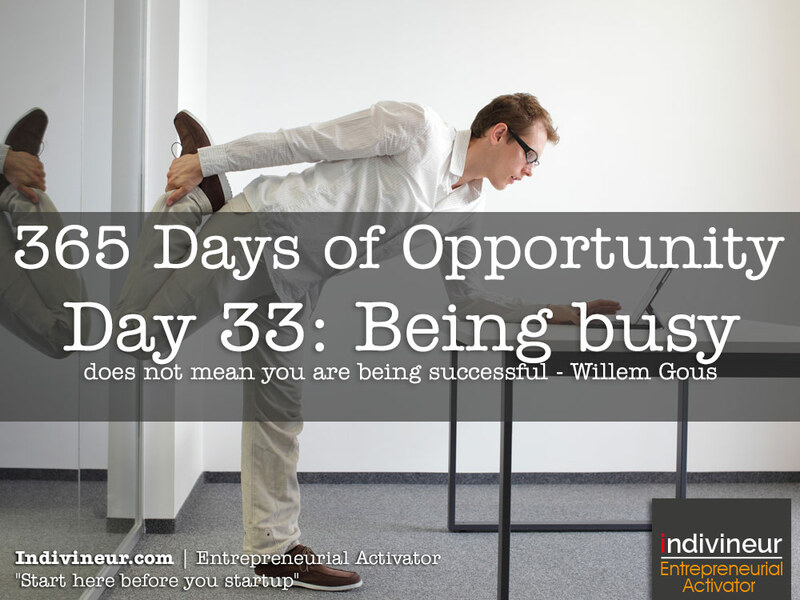 Day 33 Motivational Quotes: Being busy does not mean you are being successful. Being busy does not mean that you are necessarily accomplishing anything. Action without a clear goal or purpose will not lead to anything. Make every action count and plan your day, week, and life. Then you can achieve what you set you to achieve. Do you have your day planned? What about your life? 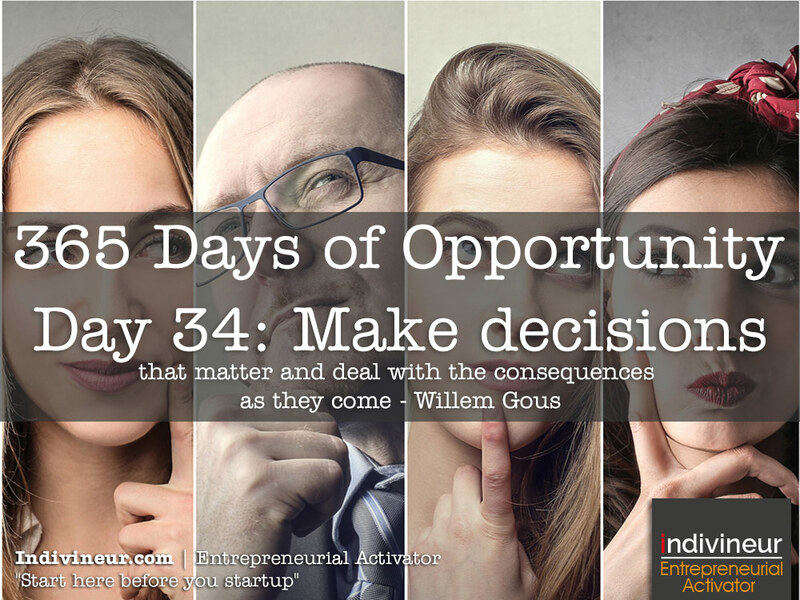 Day 34 motivational quotes: Make decisions that matter and deal with the consequences as they come. Are you stuck in over-analyses? Avoiding risk so much that you end up never making an important decision that could possible change your life forever because you keep analysing the decision in the hope that you will never make a wrong decision. Make important decisions decisively and deal with the consequences. It is the only way your life will move forward. 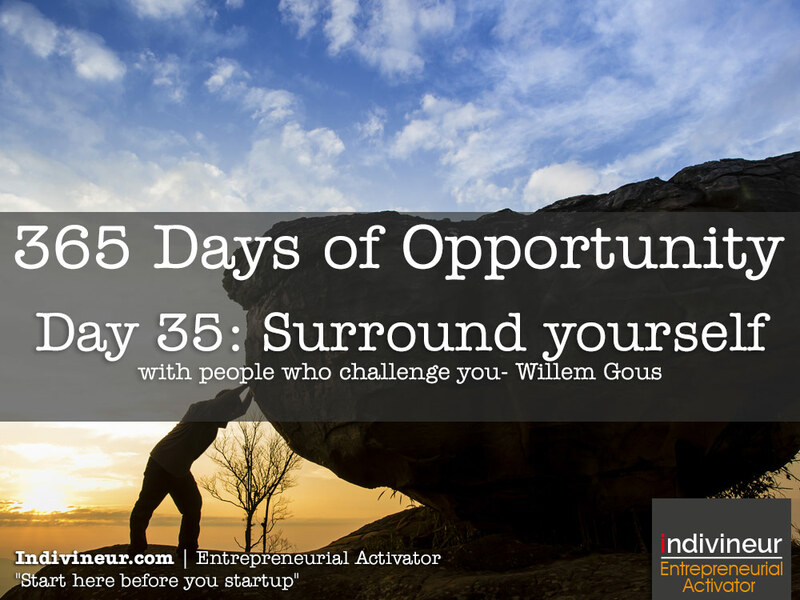 Day 35 motivational quotes: Surround yourself with people who challenge you. People who challenge you make you stronger. People who always support you can make you weak and dependent upon them. Hang out with people who will make you become more than what you are today. Day 36 motivational quotes: Avoid people who always agree with you. People who always agree with you could make you blind to risks and dangers in business. You and your business needs to grow and you only get that from feedback, feedback coming from people sometimes disagreeing with you. 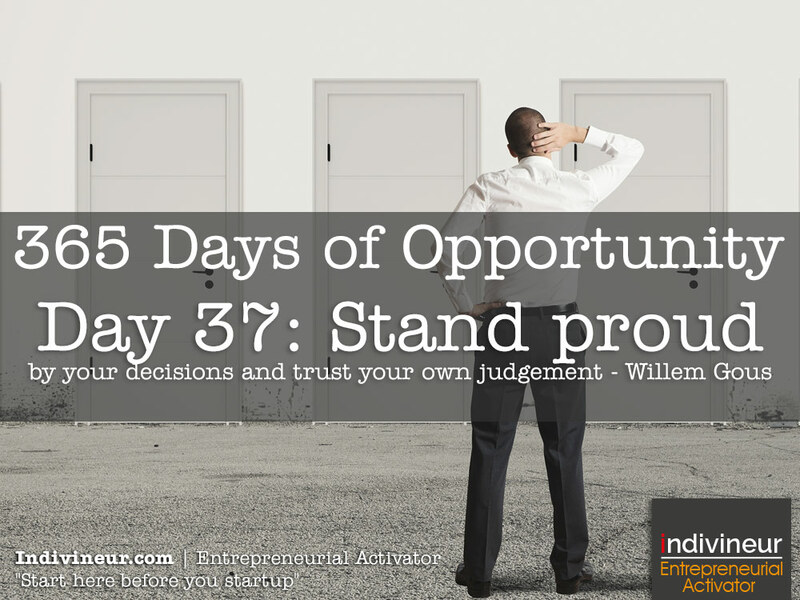 Day 37 motivational quotes: Stand proud by your decisions and trust your own judgement. Doubting and second guessing our own decisions consistently can lead to a life that goes nowhere. Your life is the sum total of your decisions. Trust that your decisions will serve you in reaching what you want in life. Remember, if one decision does not work then simply make another one, it is that simple. 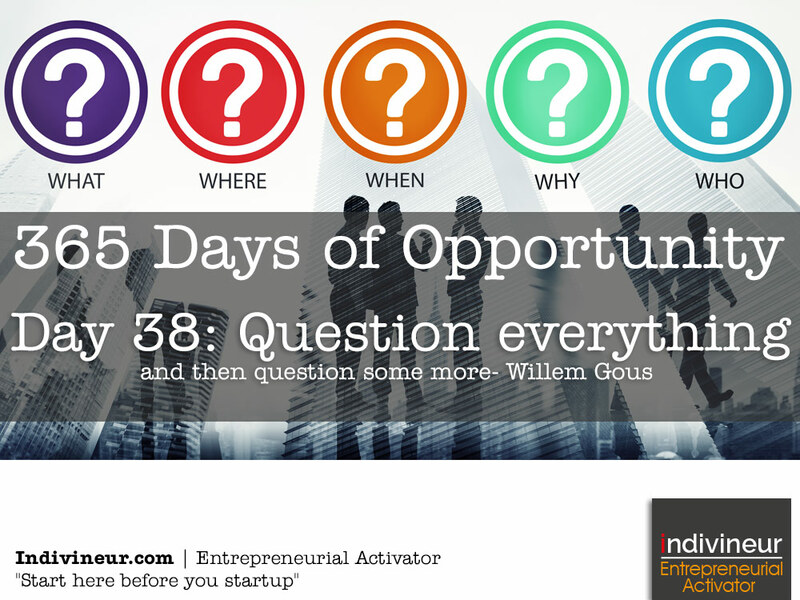 Day 38 motivational quotes: Question everything and then question some more. Questions grow your understanding and grows you. You can only change, grow or improve yourself or business once you start asking questions about your environment, your situation and yourself. Never stop asking questions. Great leaders lead through asking questions. 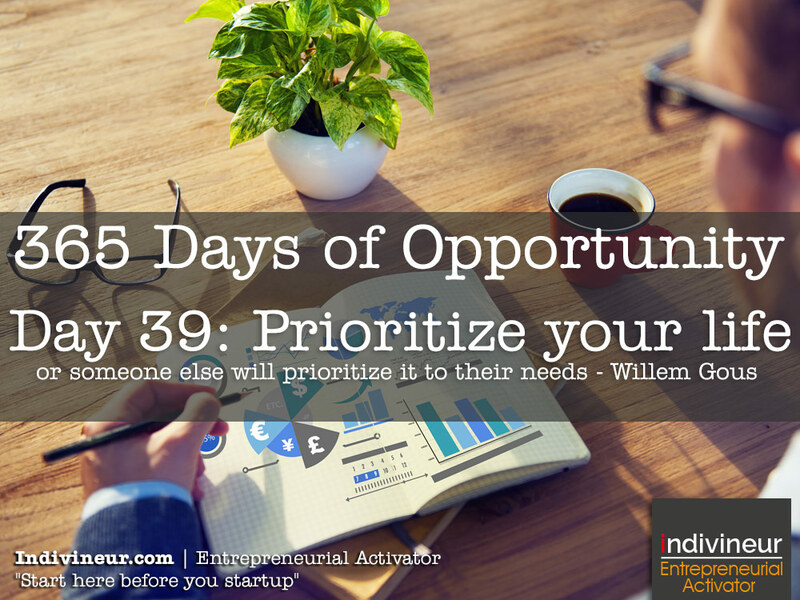 Day 39 motivational quotes: Prioritize your life or someone else will prioritize it to their needs. Dr. John Demartini once said that if you do not empower yourself someone else will overpower you. The same goes for planning and prioritizing your life. If you are not actively working at prioritizing your life you will simply fall into someone else’s plan and trust me when I say they did not take you or your needs into account. What are you going to do about it? 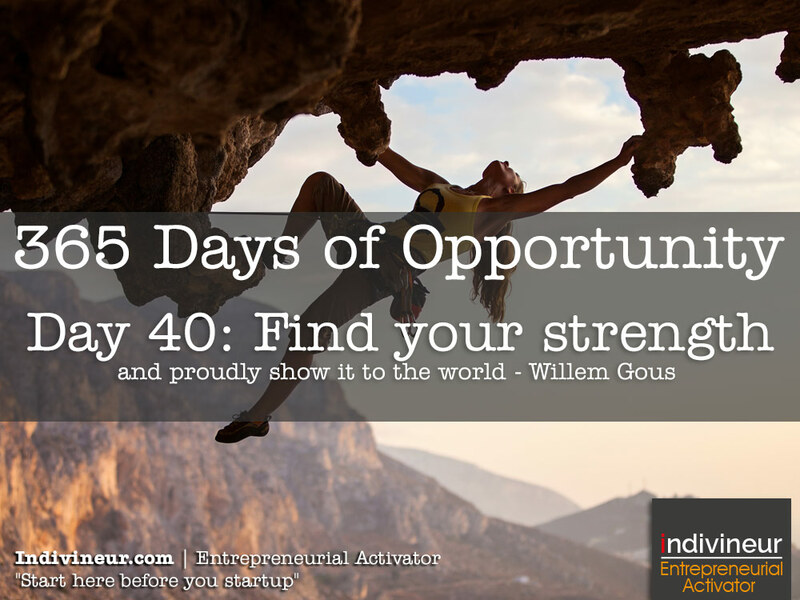 Day 40 motivational quotes: Find your strength and proudly show it to the world. Too many of us are fearful of standing proud by our strengths. We fear it might not measure up to some other person we idolize, if we are good enough, if we are worthy of having such strengths. Your combination of strengths is what makes you unique. Stand proud by them. 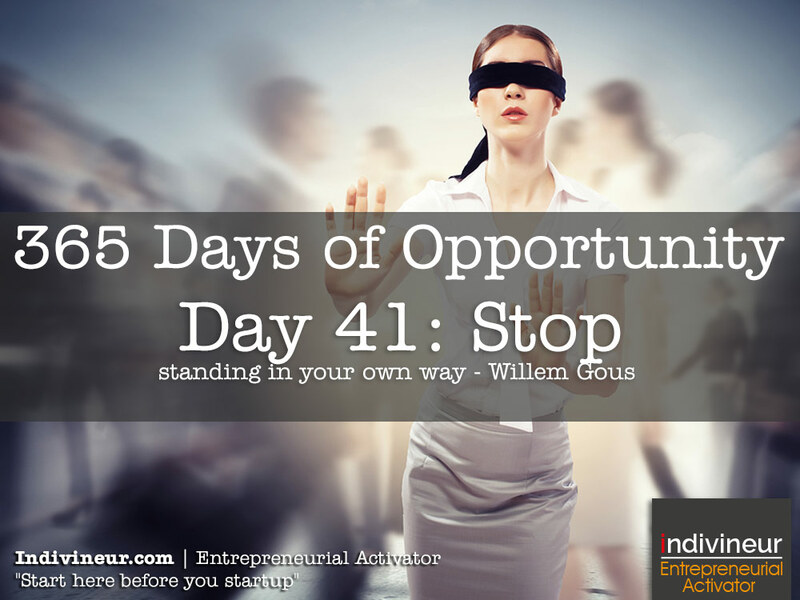 Day 41 motivational quotes: Stop standing in your own way. The biggest obstacle to our success is ourselves. Look at the habits, actions and thoughts you have that are holding you back and standing in the way of the success you want. Then change or remove them. 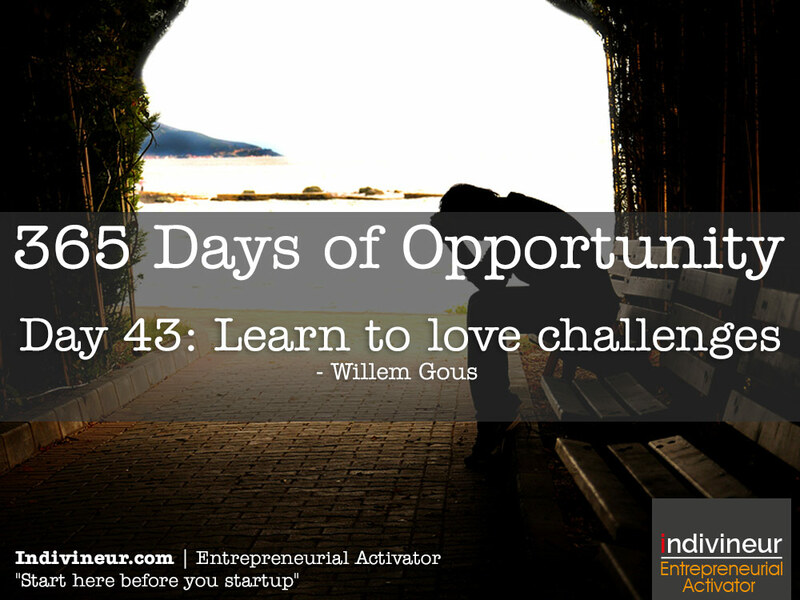 Day 43 motivational quotes: Learn to love challenges. Challenges make you grow if you choose to see them that way. If you are currently complaining about some challenge in your life then sit and think for a few minutes about how this challenge have made you grow and made you a better person. Find at least 10 positives, you can, they are there, just look out for them. 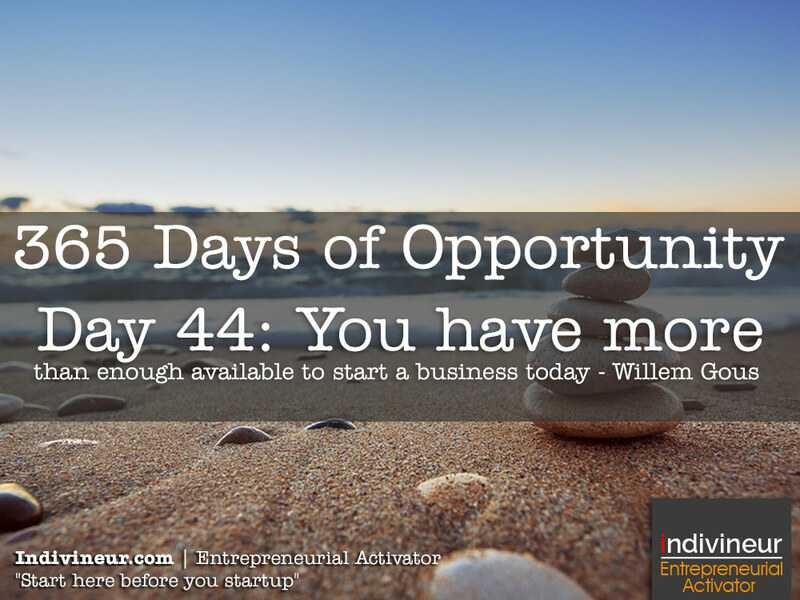 Day 44 motivational quotes: You have more than enough available to start a business today. Most people use the excuse of not having anything as the reason that they are not starting their own business and determining their own financial future. That is a lie, you have more going for you than you think, just stop and take stock of what you have and you will see you could start your own business today using what you have now. Just what I teach in the indivineur method. business with. 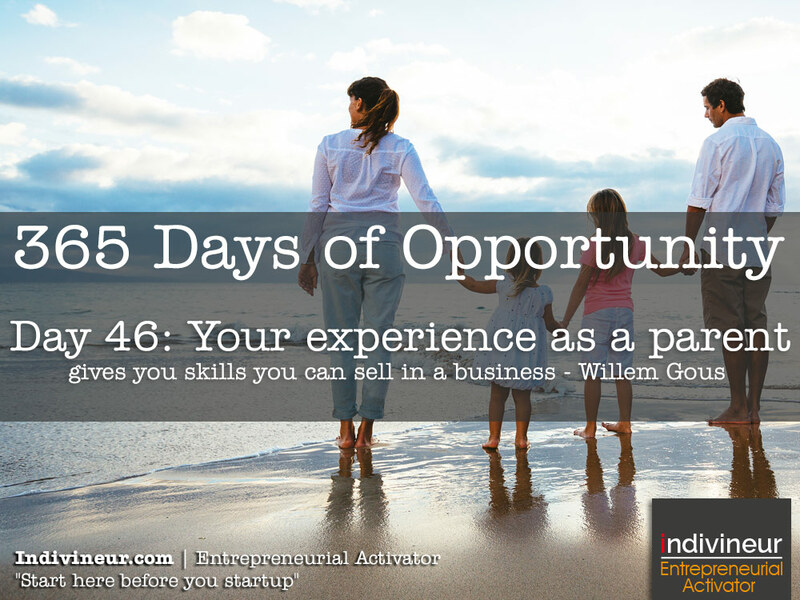 Always use the knowledge and experience you have first when starting a business. That way you will do something you are familiar with, something you have done before and your chances of success are greater. 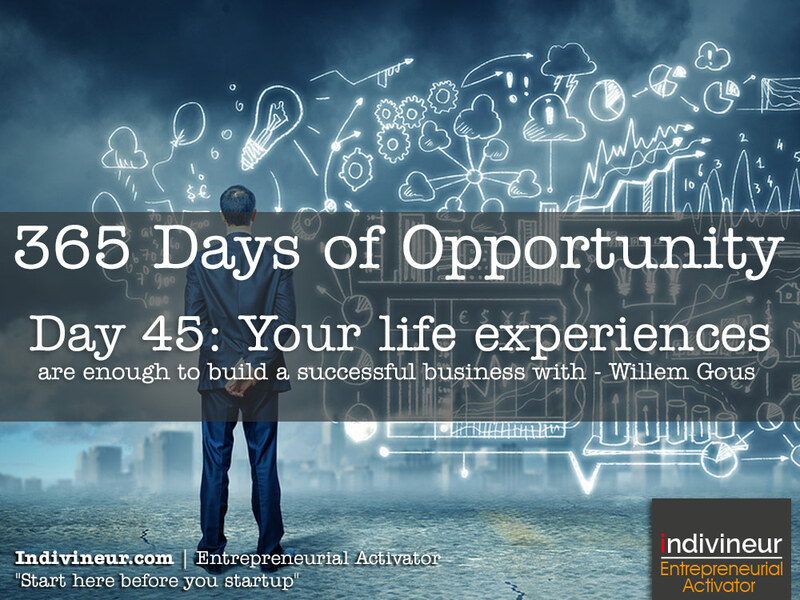 What unique knowledge or experiences do you have that you can use to start a business today? 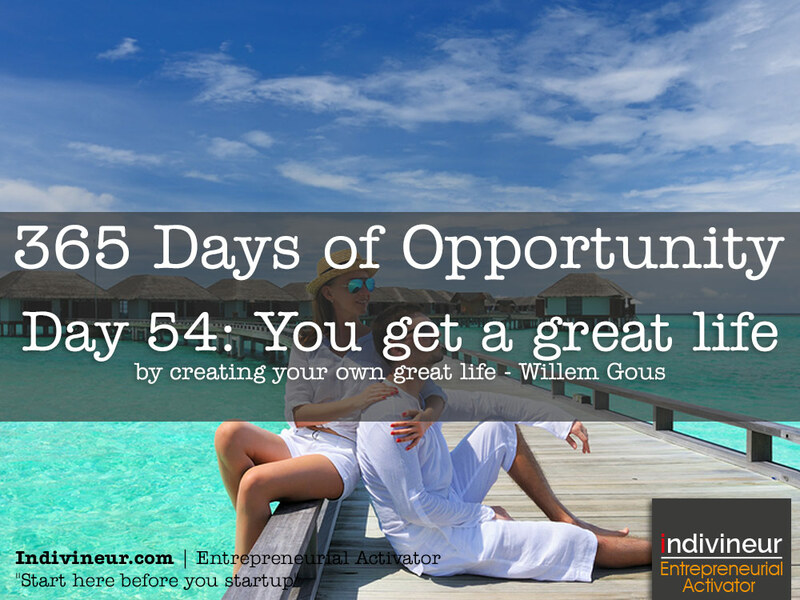 Day 46 motivational quotes: Your experience as a parent gives you skills you can sell in a business. All the knowledge you have and accumulated through your experiences as a parent can be presented and sold to new parents still learning the ropes. What can you offer other would be parents than you knew you struggled with when you became a parent? 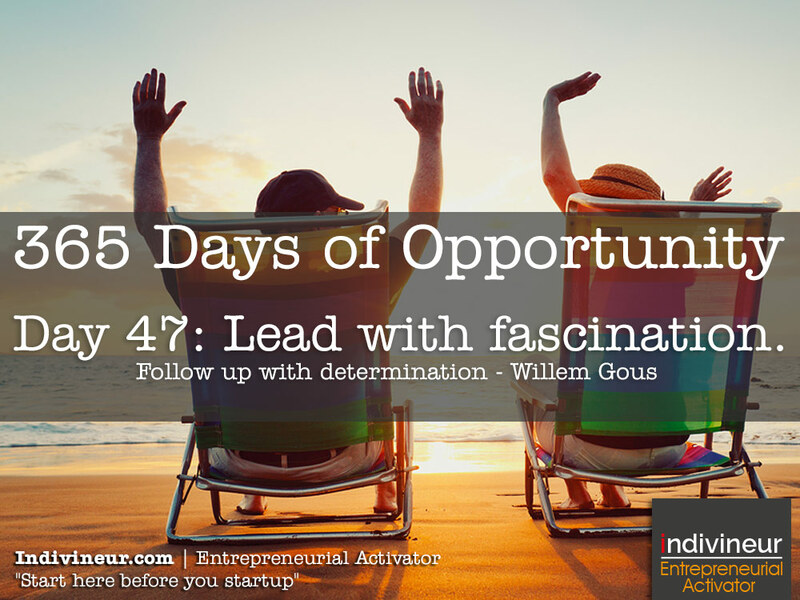 Day 47 motivational quotes: Lead with fascination. Follow up with determination. Be fascinated by what you do in life, it will give you the energy you need to follow through with determination. 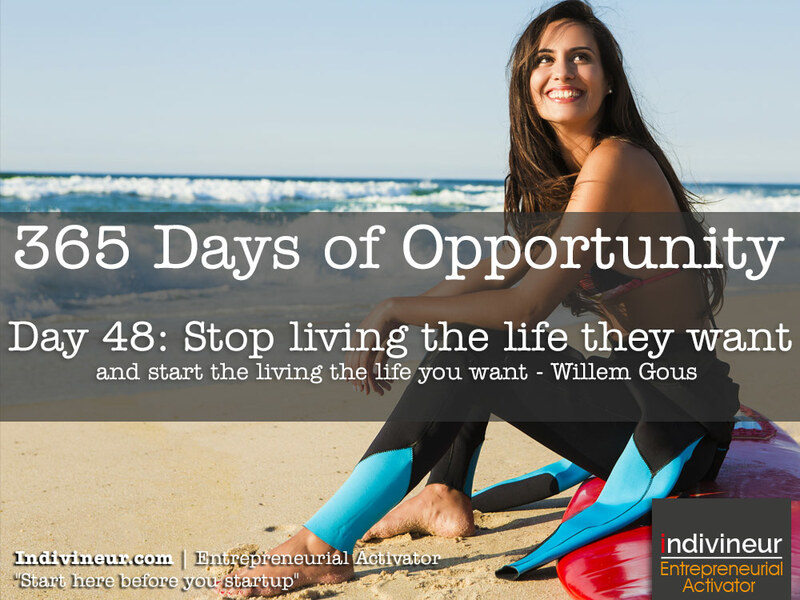 Day 48 motivational quotes: Stop living the life they want and start living the life you want. We take other people’s expectations and opinions too serious and that might lead to you trying to live someone else’s life. It is impossible. You can only live your own life, then you are true to yourself and you are giving the world the gift that is you. 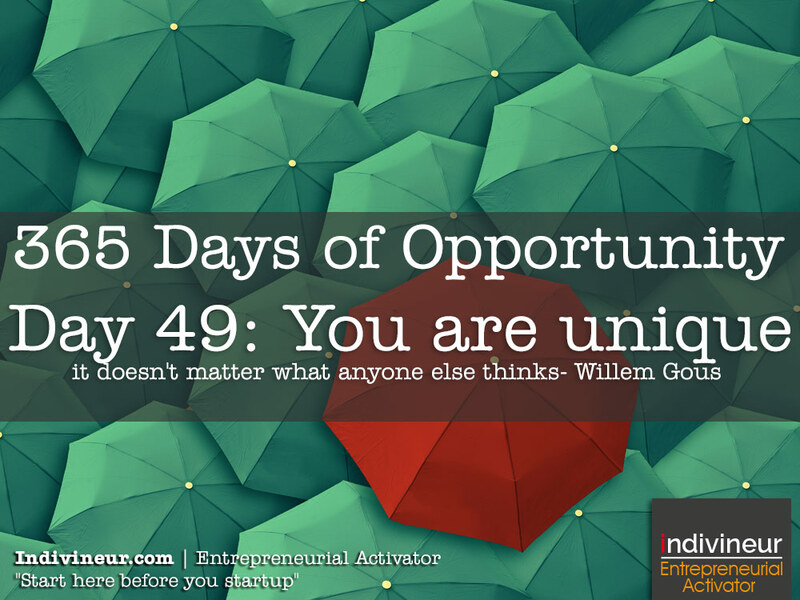 Day 49 motivational quotes: You are unique it doesn’t matter what anyone else thinks. What they think is just that, a thought. Your uniqueness shines through your decisions, actions and deeds and don’t ever feel ashamed of that. Sit and think about what makes you unique, the way you think, the way you see things and they way you do things. Everything you do differently means there is a new solution to a world problem. Solve problems in a unique way and customers will come to you. 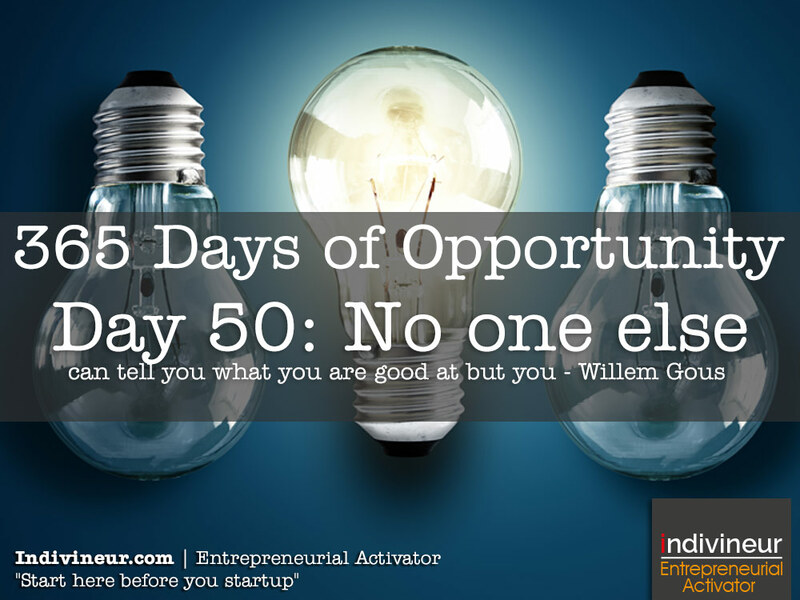 Day 50 motivational quotes: No one else can tell you what you are good at but you. When people look at your skills they look at it from their perspective and their reality, their limiting beliefs and fears also. Your skills might not have much meaning or application in their world, but that does not mean it has A LOT OF VALUE in someone else’s life. Stick by what you know you are good at, the people and customers who need that in their lives will eventually find you and reward you with their business. 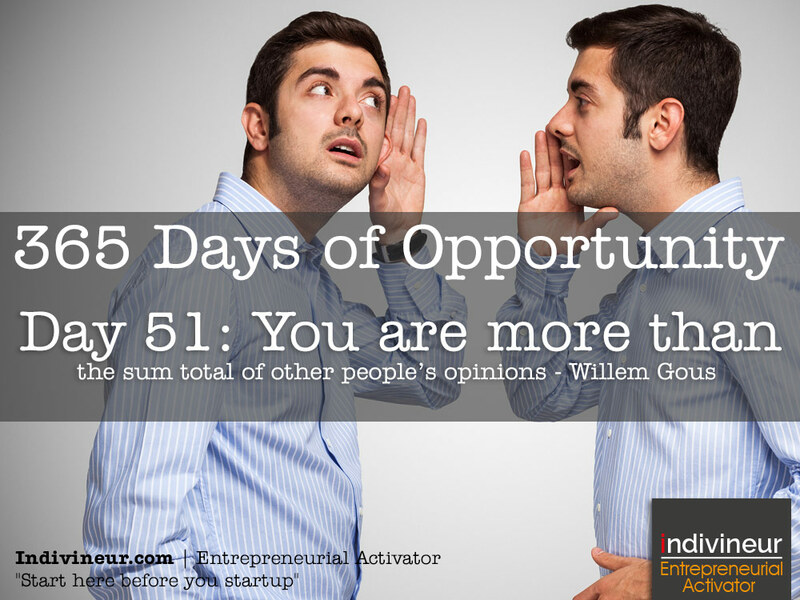 Day 51 motivational quotes: You are more than the sum total of other people’s opinions. According to some opinions I am a sinner, according to others I am a saint. The only thing that towers above all these opinions are my actions and the changes they bring about in this world. I am changing the world a little bit everyday, what are you doing? 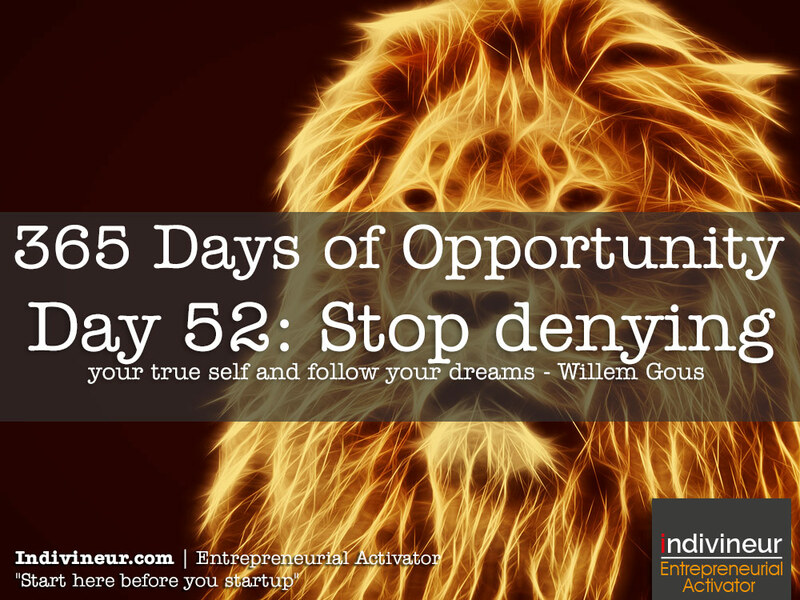 Day 52 motivational quotes: Stop denying your true self and follow your dreams. How many times have you stopped doing something, decided not to follow your heart or denied yourself something that made your heart beat faster because you were afraid of not fitting in or not being accepted by society or the crowd? Be your true self, live your passions, bring your wonder to the world and the world will love you for it. 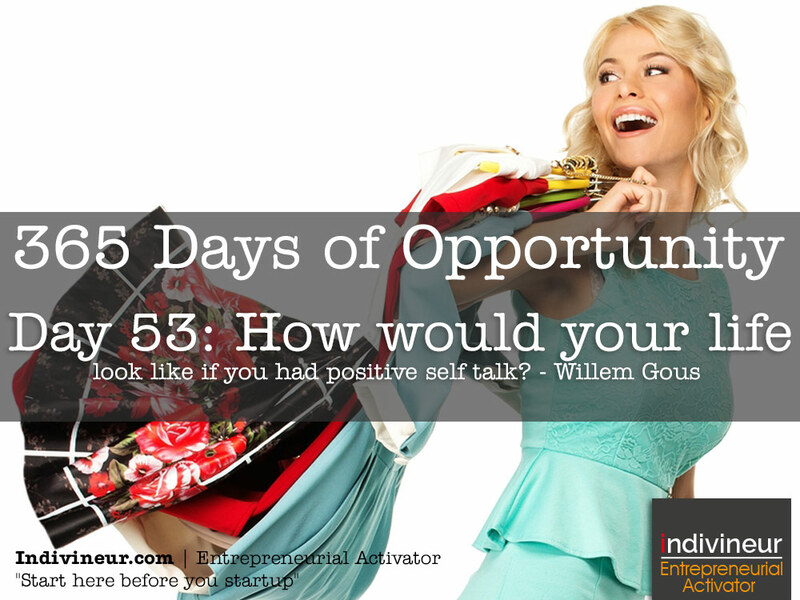 Day 53 motivational quotes: How would your life look like if you had positive self talk? I looked at my teenage daughter one day and asked myself, what type of person she would be and how her life would look like if I spoke to her the way I speak to myself sometimes. It changed my world. We sometimes use such negative and demeaning words to ourselves, “your are stupid”, “you are not good enough”, “you are ugly”, “you cannot do that or this” and the list goes on. Imagine how your life would look like if you changed those negative words into statements that build you up instead? 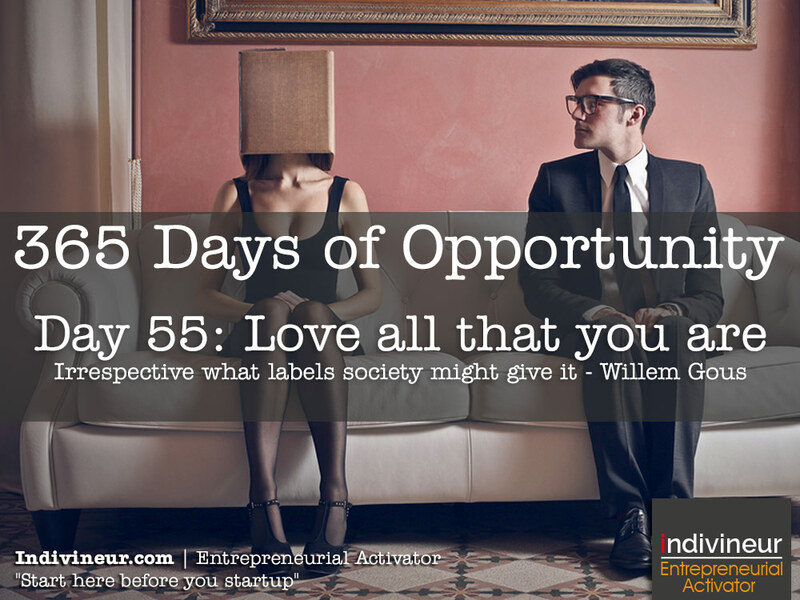 Day 55 motivational quotes: Love all that you are. Irrespective what labels society might give it. Sometimes we minimize ourselves and our own power, because some group or belief system views it in a negative light. Rest assured – as many people that see the negative will see the power in you and the beauty in your uniqueness. Love all that you are and bring you power to the world today. 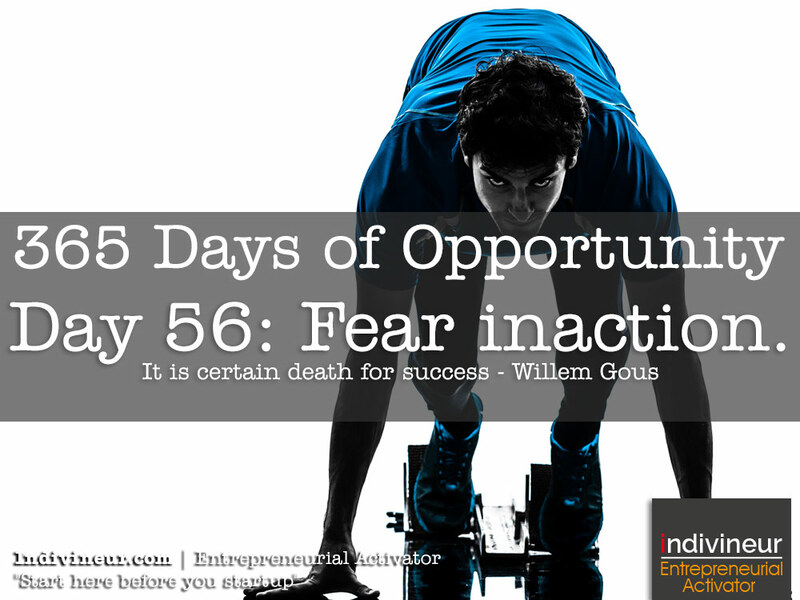 Day 56 motivational quotes: Fear inaction more. It is certain death for success. No dream or goal will ever become a reality if you don’t take action. Our actions create our world around us. If your world is small and poor you have probably taken little or no action. If you have a rich and fulfilling life then you probably took big action. It is your choice. What actions are you going to take today? 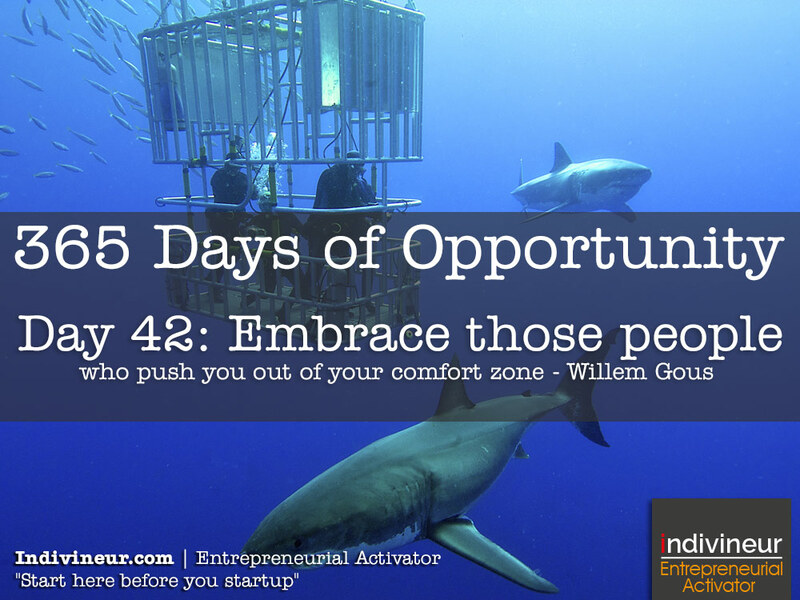 Day 57 motivational quotes: Embrace action for the rewards and lessons it brings. Taking action will lead to difficulties and challenges. If you bemoan them you will never be able to take effective action. Embrace the challenges and you will grow and so will the impact of your actions. You will change more and more of the world around you. 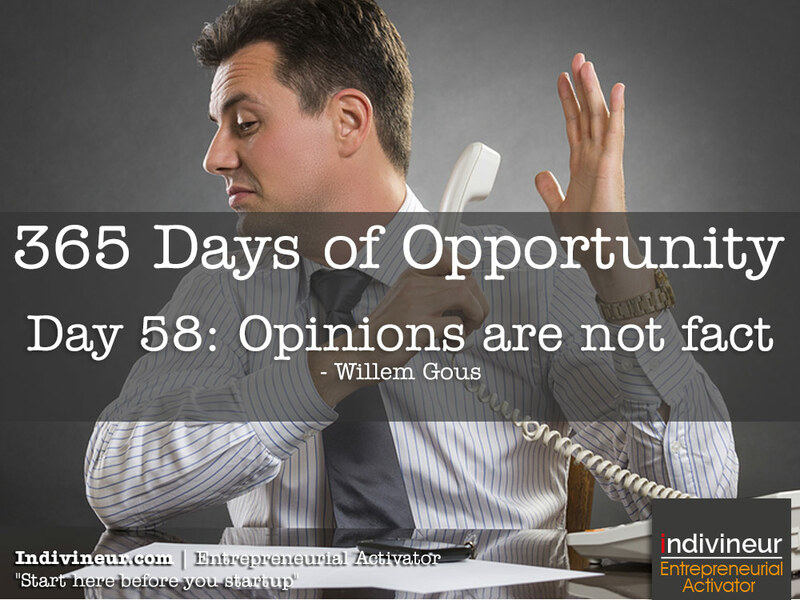 Day 58 motivational quotes: Opinions are not fact. Opinions are a view or judgment formed about something, not necessarily based on fact or knowledge. Yet, why do we believe them when other people give their opinion of us? Their opinions of us are driven and based upon their own fears. Judge yourself on your own strengths and abilities and ignore opinions. Stand by your own power and change the world according to your mission in life. Day 59 motivational quotes: People tell you that you can’t do it because they can’t do it. When someone tells you that you cannot do something they are looking at it from their perspective, their limits and their fears. It has no bearing on what your true capabilities are. Stand by your power and you capabilities and let your light shine in this world. Bring your mission to life today.